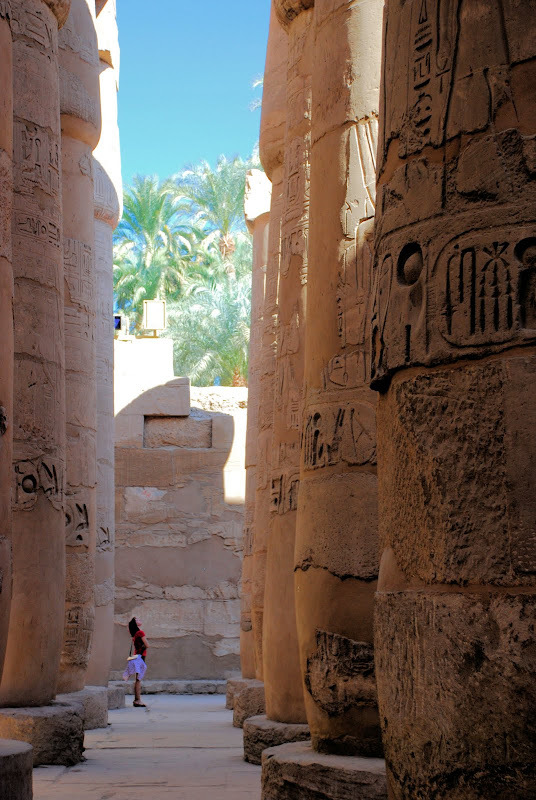 With so many temples and tombs scattered all over the city - from the East Bank of the river Nile to the West Bank on the other side - it's not surprising for Luxor to earn the distinction of being called "the world's greatest open air museum". In the days of the pharaohs, the area just north of Luxor was known as Thebes, once the all-powerful capital of ancient Egypt and the glorious city of the god Amun-Re. At the very heart of Thebes is Karnak, what must be in those days a truly spectacular complex of temples that to this day remains spectacular even in ruins. We just arrived early in the morning and have barely warmed our hotel beds for a short nap when Waleed called to say our calèches were waiting outside. We're visiting Karnak and we are taking horse-drawn carriages to the ruins as opposed to the usual tourist buses that transport visitors there. Since our hotel is close to the river, we followed the Corniche road hugging the Nile, brimming at this time with river boats docked side to side, its passengers mostly retired Americans or Europeans also on its way to Karnak or to other archaeological sites. Less than half an hour later, we reached the Visitor's Center and met Atef, our local guide. My roommate Nabil however felt suddenly ill and Waleed took charge of him - we all agreed it's best for Nabil to rest than force himself out there in the heat of the sun even though he really wanted to see the ruins. Atef herded the eight of us remaining right into sightseeing action starting with the Ram statues at the entrance to the First Pylon. Just nearby, I saw a group of locals digging and Atef said this is part of ongoing excavations as they unearth more portions of the complex that has lay hidden all this time. 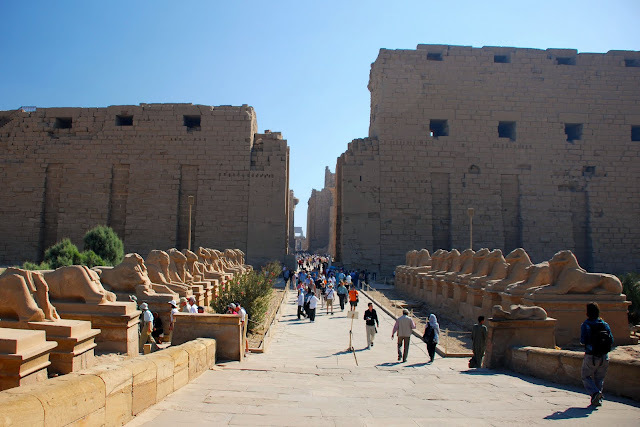 As a very large religious complex, Karnak is divided into four main precincts with only one open to the public and one that is most stunning: the Precint of Amun-Re. This is the Karnak that most people remember. We enter into the Great Court of Amun Temple and came in close contact with the reliefs on the walls at the Shrine of Seti II. But the highlight of it all is certainly the dizzying Great Hypostyle Hall with its hieroglyphics-filled massive columns, all 134 of them reaching up to 22 meters high. It took us awhile to stretch our necks as we gaze up and be mesmerized by the sheer size and height of them all. We went further, passing by the Obelisk of Hatshepsut, dedicated to ancient Egypt's only female pharaoh and winding at the Sacred Lake. At this point, Atef gave us a chance to wander around the complex on our own. To someone without a map or a guide, the vastness of Karnak might look like a mumbo jumbo of ruins. It was built in stages for more than 1,500 years by a succession of pharaohs who added something here and there, resulting in an ever expanding Karnak. However, as power shifted to Memphis in the north and Thebes lost its luster, Karnak went down as well. After Greco-Roman invasions and the eventual Arab conquest of Egypt, Karnak was totally forgotten and almost eaten up by the shifting sands until the 18th-century expeditions of Napoleon Bonaparte rediscovered them. It maybe winter in Egypt but down here in the south, noon-time temperature was close to 80 degrees Fahrenheit. We regrouped again outside the Visitor's Center, took the calèches back to town and had Shawarma lunch at a local restaurant overlooking the impressive Luxor Temple. While the girls wanted to check the local market and buy souvenirs after eating and Waleed was sending Nabil to a hospital for a check-up, I decided to walk along the Corniche back to the hotel and take an afternoon rest. 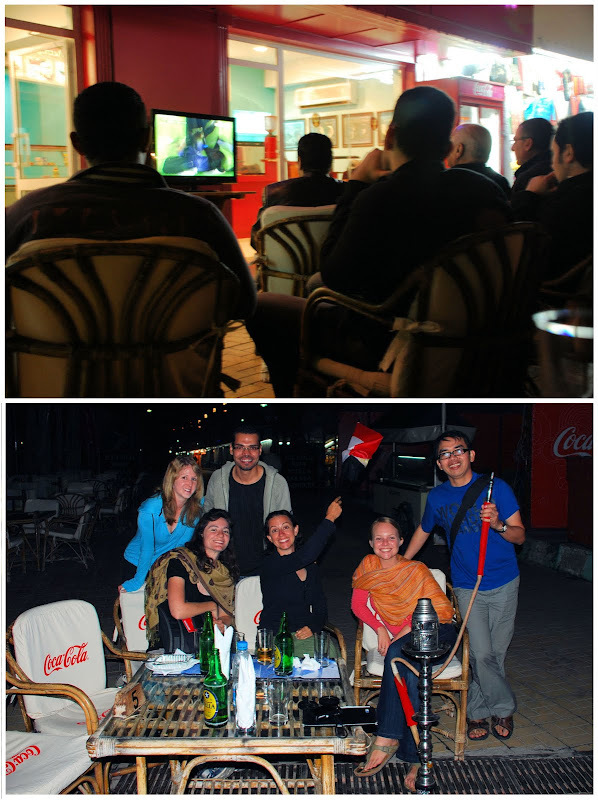 We all met up again (except for my roommate who gets admitted at a hospital) that evening for dinner at an open-air restaurant along the Nile and to watch, along with so many other excited local men, the big football match between Egypt and Nigeria. While we were munching on koftas and kabobs and washing them down with Stella Artois, Waleed couldn't contain his excitement. When Team Egypt finally scores a goal, the ear-shattering scream of those around us just showed how devoted this country is to this sport. Egypt eventually won, netting two goals. We celebrate their victory by smoking sheesha. Mabrook ya Masr! mabrook! they also celebrate here in kuwait that winning moment, too many egyptian also work ang live here in kuwait. .. nice picture. para narin akong nakapasyal sa Egypt.!. The Great Hypostyle Hall looks so amazing! 134 of them with 22 meters high. I see one has color carved on a column on the top.. They are spectacular! Thanks! You should try riding on a felluca down the Nile to the Banana Island. You can have a vantage view of Luxor from the Nile river or try the boats docked along the Nile. A la Agatha Christie's Deatrh on the Nile. James Bond too shoot one of his films in Luxor. Napapanatili nila ang ganda ng mga old statues ng Ancient Egypt! What ailed your roommate? Bad food? Weather? Too much fun traveling with young, beautiful chicks? Just kidding. Did he get well in time to rejoin your group? OMG, you went to Cairo! I just saw the Canadian film, Cairo Time! I want to go!! Except, I'm 8 months pregnant and will have to wait before I can travel again. Needless to say, my feet are very, very, very itchy!! Almost burning!! By the way, we are naming baby girl no. 2 CAIRO !!! By the way, I meant to say, "OMG, you went to Egypt (not Cairo)!" I blame it on the pregnancy hormones! Oh wow. I disappear for a few days in the blogosphere and here you are in exotic Egypt! 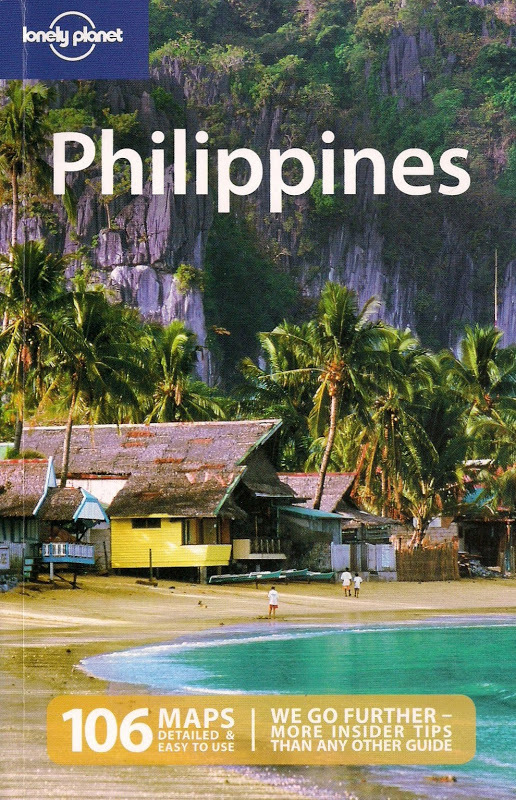 I so love the pillars, and yes, I have Egypt on my list as one of the destinations that I want to visit in the future. I would love to go down to Abu Simbel, then go up to Aswan, Luxor, and back to Cairo. I guess by now you know I am a history buff when it comes to traveling. Wow...what an amzing city... what a grand architecture ! Huwaw! Super galing naman tong leg ng trip mo. Cairo and the pyramids weren't in the top of the my bucket list but after seeing them, I am so inclined to see Luxor as well. I may never get the chance so your post is really appreciated. I'm speechless scrolling down the screen, what more if I was there looking at this in person. Hope to visit Egypt one day..... in the mean time gotta work hard and save up! Malapit ka lang pala sa Egypt Ever, try mo nga! Some parts incredibly still retain the original colors after all these years! I heard a James Bond movie was shot in Karnak. We took the felluca in Aswan - more on this later. They have a government body - I think it's called the Supreme Council of Antiquities - that administers all the ancient sites. Thanks Lionheart. I've actually tried sheesha several times in the past and I do whenever there's an opportunity for it even if I don't smoke as a rule. Thanks for the visit racq! He had a host of symptoms but after he got discharged late the next day, he rejoined us before we left Luxor. Sounds like a great name - never met anyone named Cairo yet! I wish you a safe pregnancy Jen. The four of you can travel anywhere after that! I know this is your kind of place. Abu Simbel will be appearing later as I update my entries. Part of any visit is always experiencing the local goods - not just the sights. Thanks Cecil! Great company, great food, great drinks and of course, great sights equals great experience! Thanks Sidney. I was hoping you'd say that because I know you visited Cairo & Alexandria and missed the south - perhaps a return trip in the future for you and your husband? it's French but that's how they're called in Luxor. holy kamote! I love your photos! i'm so jealous of your trip! i've been wanting to see egypt and ride camels!